Southborough has always had an impressive showing at the Boston Marathon, and this year is no exception. Between now and Patriots Day, I’m featuring stories of resident runners donning bibs for a cause. Resident Jeremy McDowell is running on behalf of those who don’t have “the gifts [he’s] been given” – as a father in a “healthy happy” family. On April 15, 2019 I am honored to be running in the 123rd Boston Marathon. Growing up in Boston, Marathon Monday has always been as hallowed to me as seeing the Pats in the Super Bowl. But I’m especially motivated because my love of the Boston Marathon and running will benefit a worthy cause. 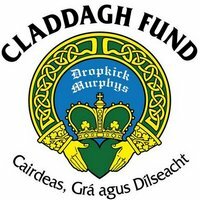 I am running for the Claddagh Fund, a charitable foundation started in 2009 by the Dropkick Murphys. Their mission is to raise money for the most underfunded children, veterans, and alcohol and drug recovery non-profit organizations in our local communities. If you know me well, you probably know that I spent most of my teenage years and early 20s touring around in a van playing in a punk rock band, so I’m thrilled to support the Fund and the Dropkicks. But things are different now. I have a family. 3 kids. And each day I appreciate the gifts I’ve been given. Every night when I come home from work, my kids line up to give me a kiss when I walk in the door. Not every dad is so lucky to have healthy happy kids waiting for him at home. And not every kid has a ‘Dad’ waiting there to help them through life’s ups and downs. I’m running to help vulnerable and disenfranchised children receive the developmental, medical educational, and social support services to believe in themselves and live healthy happy lives. I’m running to help the kids and families of vets whose mom or dad can’t hold them again because they’ve given the ultimate sacrifice to honor their country. I’m running to help those afflicted by addiction to become better versions of themselves by getting the love and programmatic support they so desperately deserve. I am committed to raising at least $5,000 for the Claddagh Fund and I need your help. Your tax-deductible contribution will help the Children’s Charities, Veterans Charities, and Drug and Alcohol Rehabilitation charities the Claddagh Fund supports. By donating today, help me symbolically carry the burden of these brave men, women, and children for 26.2 miles (and 100s of miles in training) on Marathon Monday. Don’t wait. The goal of this campaign is to raise $5,000 for the Claddagh Fund by April 15, 2019. But you can make an immediate difference by donating today. To learn more about the charity and/or support his fundraising run, click here.